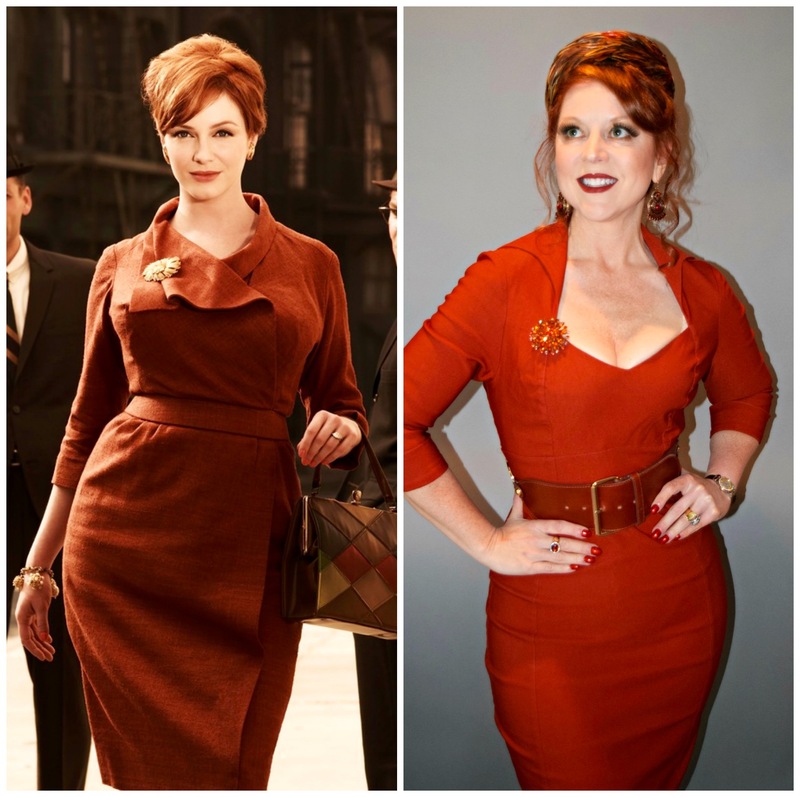 For as long as I can remember, people have told me I remind them of whatever redheaded female TV or movie actress/character happens to be en vogue at the time. As a child, it was Pippi Longstocking; when she first came on the scene and we both had long curly hair, it was Nicole Kidman; after Titanic, it was Kate Winslett; for the last couple of years, it's been Mad Men's Christina Hendrix (aka Joan Holloway). I've never been offended by the comparisons (who would be?) but, frankly, it's very little to do with anything other than a shared hair color and it's relative rarity. That's okay. 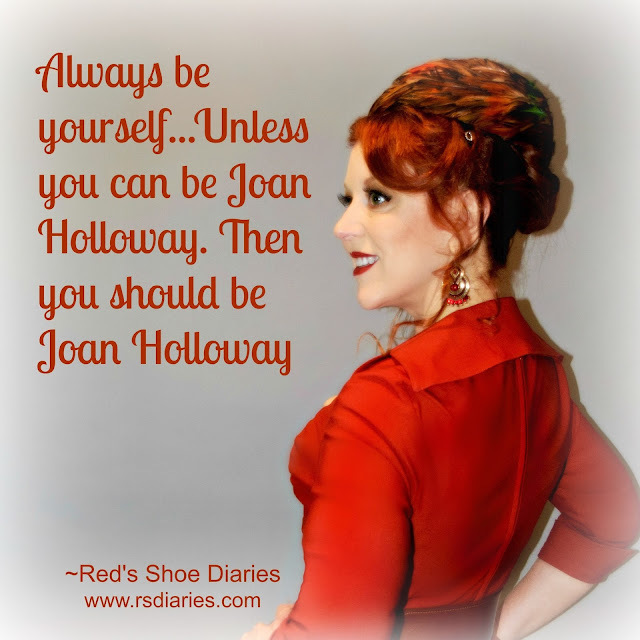 It may have taken me more than 30 years to fully embrace my ginger genes, but these days I don't want to be anyone other than a constantly evolving and better version of myself. 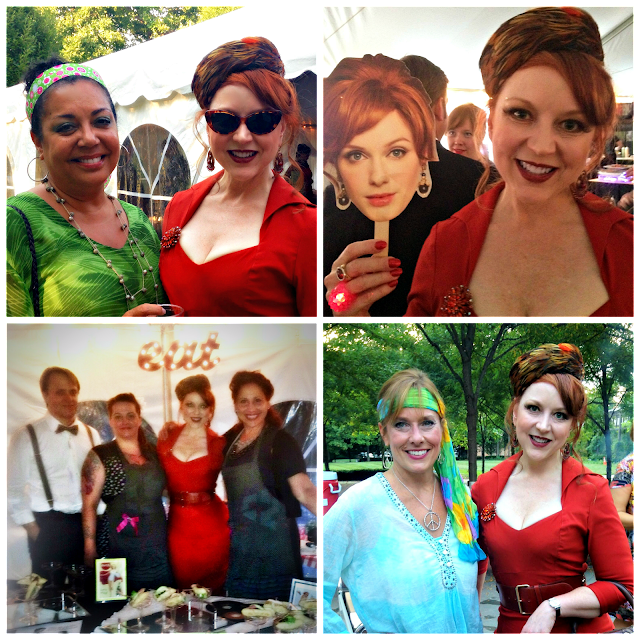 That said, I didn't mind posing as Joan's doppleganger for a charity fundraiser last weekend. Guests were encouraged to come as their favorite Mad Men character and/or dress in favorite 60s styles. 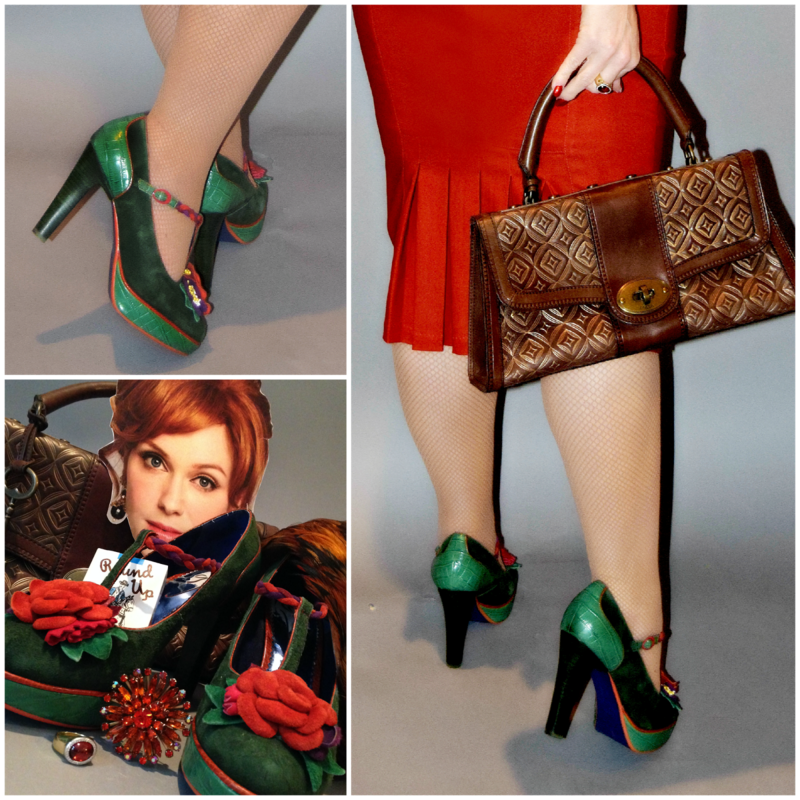 If you know me at all, you know how much I love vintage fashion, so the theme was right up my alley. Of course, with this hair and our somewhat similar proportions, coming as Joan was a foregone conclusion. I have to admit that, with the right dress; a vintage brooch; and my hair pinned up, there is actually more than a passing resemblance. 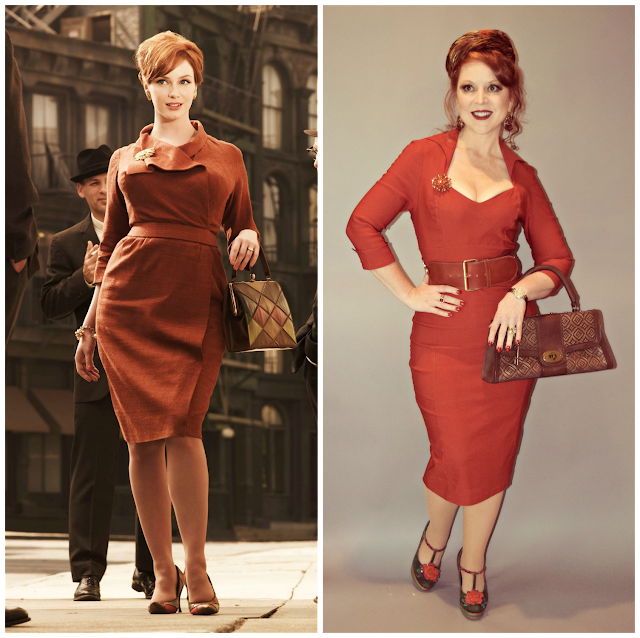 Indeed, there was no question which Mad Men character I was channeling. Yet,the best compliment I received all night came from an older woman I'd never met before who said, "Honey, you don't even look like you're in costume. You just look like those are the clothes you wear and that's who you are." Thank goodness, because these really are clothes I wear in my everyday life! In fact, every piece was already part of my wardrobe, though I hadn't put them all together in quite this fashion before. Rather, I typically mix vintage finds (like the 1960s orange crystal brooch) with newer pieces to create my own unique and (hopefully) somewhat timeless looks. You look absolutely fabulous! 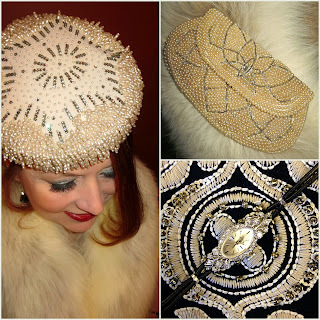 I have a love for vintage too, and the feather hat tops off your ensemble to perfection. Thank you for sharing with Hat Attack!